Developer: UMS Research & Development Division "The Manhunt"
The Manhunt begins where Return to Na Pali left off - with the crash of UMS Bodega Bay. The player, Bodega Bay's Executive Officer, must find a way off Na Pali, then locate and apprehend or eliminate the fugitive, Prisoner 849. Meanwhile, the Bodega Bay's Captain, John Clark, awakens in a Skaarj research facility and is subjected to a brutal interrogation. He manages to escape the facility but must find a way off the planet as well. - new weapons, amonst them: Unreal II's terran arsenal. Bleeder, SteadZ, Z-Enzyme, Dozey and myself are working in concert on this one, alongside Episodes III: Operation Stealth Claw and IV: Na Pali War. While we do not specifically require fresh blood in our ranks, it'd certainly be most welcome! These screenshots looks really intriguing. 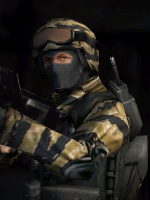 Tell me, is that bleached skin I see on the player model or is it my imagination? Necris perhaps? It's a placeholder from a skin pack. One of the reasons I've been delaying starting this thread since... MARCH?!... was because the protagonist model ain't really ready. Well not even started on yet. Z-Enzyme is however making so much for the project I wouldn't even dare to begin complaining about the order in which he makes models... I swear, this guy would outclass, outrun, outskill and outmaneuver any machine he'd compete with. I'd prefer first person view option, anyway. No matter how cool new model will be. waitwaitwait. this is going to be overtheshoulder? Primarily, yes. This is going to be overtheshoulder. While I am still ambivalent about keeping or ditching the FPP mode (I'll PROBABLY keep it), the primary recommended view will be over-the-shoulder third person perspective vide Mass Effect. Delacroix wrote: Primarily, yes. This is going to be overtheshoulder. While I am still ambivalent about keeping or ditching the FPP mode (I'll PROBABLY keep it), the primary recommended view will be over-the-shoulder third person perspective vide Mass Effect. FPP is more immersive. I don't bother with third person games, I'm sure others think this way too. Delacroix wrote: I swear, this guy would outclass, outrun, outskill and outmaneuver any machine he'd compete with. Are you talking about Z-Enzyme .... or the model he's making? About Z-Enzyme himself of course. He just rocks, period. Two pics from the Commander's side of the story - from the very beginning. Skin: DeathKnight (Red) by Kasarul, so not the protagonist's... placeholder. If you're looking for another mapper, I'd be quite eager to make some winter-themed levels for you! (I've been making a few now for the sake of fun alone).